Acrylic Painting: History, Techniques, Applications,Tips. Acrylic painting refers to a 20th century medium and that shares many characteristics of oil painting without its draw backs. Acrylic dries fast, as it is water soluble, thus enabling the painter to work faster. This is one the main reasons that has made this medium so popular among artists. Acrylic painting. Painter and sculptor Jim Stevens has been a professional artist for more than 15 years. He vividly captures portraits using oils, acrylics, and his trusty yellow no. 2 school pencil, the kind with a silver ferrule and a pink eraser on the end. Stevens' award-winning work is collected internationally. He's been featured in galleries in Seattle and Denver, where he lives. After leaving the army, Stevens began teaching at the University of Colorado. He was preparing a lesson plan when what he was typing on his computer started to disappear. "At first I thought there was something wrong with the computer," he says. "Then I looked down at my notes and half of them had gone too and I realized it wasn't the computer, it was me." When he woke later in the hospital, he was told that a bullet fragment in his head had shifted, causing a stroke in his visual cortex — the part of the brain that processes sensory nerve impulses from the eyes. In just 30 minutes, Stevens' vision had been reduced to a pin-dot in each eye. Doctors said his eyesight would never return to normal. Stevens' immediate reaction was anger. He took a crowbar to his motorcycle when the DMV refused to renew his license and resented the white cane he now needed to get around. He lost his job, his marriage disintegrated, and suddenly he was the blind, single parent of two young daughters. Depression threatened to crush him completely. Acrylic painting. Then one day in 2000, his daughters urged him to take up art again. Stevens' grandmother had taught him to draw and paint when he was a boy. Though he never went to art school, he later studied with the sculptor Ed Dwight as well as Ukrainian stone and gem-carving master Vasily Konovalenko. Despite his career in the military and academia, art was always something Stevens kept in his back pocket, working on it whenever he had the opportunity. But after losing his sight, he took a baseball bat to every piece of art in his studio. He hadn't created anything since. His first attempt was a carving of a wizard, requested by his daughter Meeghan. At one point, he became so frustrated he picked up the piece and hurled it across the room. Meeghan sat it back down in front her father and told him, "You promised not to quit." "As the clouds went over, they caused the monofilament on my fingers to appear to ripple," he explains. "It was such an arresting look, I couldn't get it out of my head." Acrylic painting. To create a portrait, he uses photographs taken from different angles and redraws them until he understands his subject's facial features in their entirety. Because he can't see the whole image at once, he then produces a dot matrix which acts as a guide. By counting the dots and working in small sections, he knows where each section stops and the next starts, and where to blend the two together. "Without the vision I had before, every step of painting is patience," he explains. Acrylic painting. One monofilament painting is made up of eight layers with more than a thousand strands and takes Stevens about two months to complete. The monochrome images have a striking depth and are unmistakably accurate, yet viewed from the side they appear suspended in space like an illusion. This play on shifting perspectives, light, and tone is central to Stevens' work. "I can pick up lights and darks best with what little vision I have," he explains, "and so working in tonal qualities to create an image is something I really enjoy." Acrylic painting. Most of his work comes from commissions. These days, he's so busy with his art he's "forgotten to be angry." He's also director of the Veterans Arts Council at VFW Post 1 in Denver, the first VFW post in America, which unusually has an art gallery instead of a bar. "For a lot of veterans, especially combat veterans, art has a way of refocusing their attention into something more constrictive than feeling sorry for themselves or angry all the time," he says. "One gentleman was considering suicide until he got his artwork into Post 1 and people began buying it. It gave him a new lease of life. He had a purpose again." Acrylic painting. This year, Stevens won the Veteran's Administration National Gold Medal for Fine Art, an award of which he feels especially proud given that it was decided by the ex-servicemen and women with whom he feels "a special kinship." But his accomplishments go beyond visual arts. At the age of 51, Stevens took up martial arts and became the oldest man — and only legally blind one — to win the men's fighting competition at the multi-state Tournament of Champions. His sensei made sure no one knew Stevens was blind until the competition was over. Acrylic painting. On a clear day, Louise Nutter can see 10 of Cook Inlet’s oil and gas platforms from the deck of her house in Nikiski. Hilcorp’s four platforms in the Middle Shoal unit stand out near the blue-gray horizon, and the Furie-leased Kitchen Lights gas field sprawls to her north. These fixtures of Nutter’s view are also stars of her paintings. One large canvas features Hilcorp’s A platform. The finely rendered red Era helicopter that occupies the painting’s foreground was used by the platform’s previous owner, XTO Energy, before the sale to Hilcorp. This out-of-date detail has kept the painting off the market — most of her art buyers, Nutter said, are oil and gas workers or executives for whom such details are relevant. They are relevant, too, for Nutter — a stickler for accuracy who paints what she knows. Raised in upstate New York, Nutter came from a flying family — her father flew Hellcat torpedo bombers during World War II, hunting German submarines in night flights over the Atlantic. Nutter said her first artwork was of airplanes. Her aspirations have also focused on aviation since she was a teenager, when her father asked what she’d do with her life. Acrylic painting. Instead she was laid off by her employer, General Motors, and moved west to take up aerial fire-fighting. Later she became a 747 cargo pilot making flights to the Middle East as a civilian contractor during the Iraq and Afghanistan wars. Her career eventually brought her to Alaska, where she planned to fly helicopters to and from Cook Inlet platforms. Though she has yet to make a platform flight, this ambition has informed her art. Acrylic painting. Nutter’s idea turned out to be untimely. Soon after she created her studio brand — Burning the Midnight Oil — the industry took the plunge from which it has yet to recover. She remains optimistic. Nutter’s art has continued following the wandering path of her experience, from the sky to the sea. Nutter now does most of her painting on a boat she recently bought and docked in Whittier. Acrylic painting. Nutter had been an admirer of Halibut Cove-based artist Diana Tillion, who specialized in sepia-toned ink washes using octopus ink. Nutter liked the look of octopus ink on paper, but held back from using it herself. “I didn’t want to steal (Tillion’s) idea of harvesting the ink and using it to paint,” Nutter said. A chance encounter in Homer with Tillion’s daughter gave her the license she sought. This led to a series of prints using not only octopus ink, but the octopi themselves. Other recent paintings feature the details of oil technology. Nutter’s series focusing on the aesthetic details of heavy industrial drill bits could be described as portraits of the tools oil drillers use at different depths to penetrate different materials. Despite oil’s price slump, Nutter has found some commercial success with her industry-focused work. Three of her paintings hang in the dining room of Anchorage’s Petroleum Club, and she’s currently trying to market a children’s book she’s written about oil and gas engineering. Acrylic painting. Her newest platform painting features Cook Inlet’s newest platform, Furie’s Julius R monopod, installed in August 2015 — the first new permanent platform in the Inlet since the 1980’s. Nutter’s depiction of it is flanked by designs resembling gas flames or oil gushes. The water and sky around the rigid structures of her platforms and aircraft is made of daubs of impressionist color. When asked about the contrast between the tight detail of her machines and the brighter, hazier abstraction of their surroundings, Nutter said the difference seemed to come from her personality. Reach Ben Boettger at: ben.boettger@peninsulaclarion.com. The Chicago Cultural Center, where Mr. Schulman oversees exhibitions, will host the show from June to September 2018. Acrylic painting. Photo A detail from “Spheres of Influence” showing dead waterfowl and the Northwest Orient plane that crashed into Lake Michigan in 1950. Credit Hiroko Masuike/The New York Times. 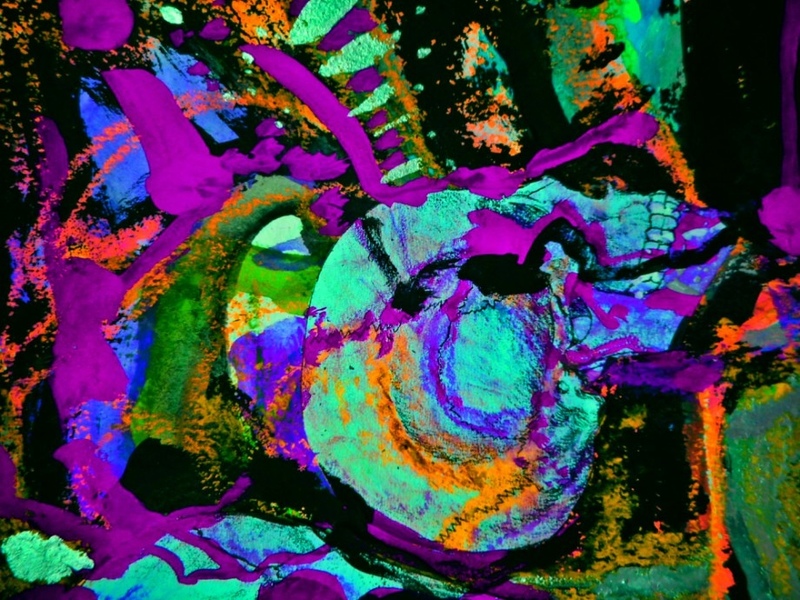 Mr. Rockman, 55, whose mother is an archaeologist, perhaps sums up his work best, calling it “natural-history psychedelia.” He is known for bridging the worlds of art and science — his exhibition “A Natural History of Life in New York City,” which was shown at Salon 94 in New York last year, consisted of 75 field drawings of animals and plants from the five boroughs, ranging from the prehistoric era to the present. And when the director Ang Lee was working on the movie “Life of Pi,” about a young man trapped at sea on a boat with a tiger, he asked Mr. Rockman to be the “inspirational artist” to define the look of the overall film. Among other things, Mr. Rockman did watercolor drawings of hundreds of pictures of ocean life based on natural history and his imagination. His research included an expedition to Lake Michigan and Lake Superior, following an itinerary devised by the Grand Rapids museum. Over two weeks, he talked to experts, traveled to dunes, joined a charter-boat fisherman and visited the Great Lakes Shipwreck Museum and an abandoned copper mine. He also made visits to other Great Lakes. One of those was Jill Leonard, a fish biologist at the university, who sat with Mr. Rockman at a Starbucks for three hours and hashed out the themes of the five paintings. The paintings, Ms. Leonard said, will become a resource on her university’s website and will include short essays, videos and illustrations. Mr. Rockman also said he would be available to the museum, local schools and institutions for workshops and lectures. His driving force was to capture the geographical, physical and ecological changes of the lakes over the centuries, but not in a linear way. And there’s the unexpected. Underwater in the foreground of “Spheres of Influence” is a DC-4, the Northwest Orient plane that crashed into Lake Ontario in 1950, while on the horizon is the H.M.S. Queen Charlotte from the War of 1812. Acrylic painting. Mr. Rockman’s paintings have “theatricality and overstatement, which is all backed up by how great a painter he is technically,” Mr. Schulman said. The paintings will be shown with keys so viewers can identify the various objects. The exhibition will also include six 4-foot-by-6-foot watercolors and 30 field drawings. Mr. Rockman uses materials he picked up during his travels around the lakes to create the drawings, such as coal and sand from dunes. Jill Snyder, executive director of the Museum of Contemporary Art Cleveland, which will show the paintings from October 2018 to January 2019, said the works “bring you into the past, present and future of a locale,” but also addressed compelling global issues. An earlier version of this article and a picture caption misstated the location of the crash of a Northwest Orient plane in 1950. It was Lake Michigan, not Lake Ontario.